Tree swings are a part of the quintessential backyard dream. They’re nostalgic, whimsical, and fun. These convenient toys – or comfy, quiet sitting spots – can be more visually appealing than a regular swing set, and also take advantage of natural features in any yard. However, they can be more difficult to set up than they initially seem. We don’t want to accidentally damage the tree used for the swing, and we definitely don’t want anybody to get hurt, either during the setup process or from the swing following. So, be sure to follow these steps to properly hang a tree swing. Here we will look at the steps required to hang a tree swing, and the various options to consider for methods. For any individual method you choose, be sure to follow the directions of the item. A tree branch is a heavy wooden limb which extends directly from the trunk. Excluding the trunk, they are the thickest and strongest part of the tree. Someone who wants to hang a swing should find a branch that is relatively free of twigs, leaves, and smaller boughs. The branch should also be at least 8 in. in diameter and be at least 12 ft. off of the ground but no higher than 20 ft. A limb of this size should be able to hold around of 170-190 lbs. Someone who is heavier but would still like a swing should consider finding a thicker branch for safety reasons. You’ll need to inspect the branch closely to confirm that it is appropriate for a tree swing. The branch needs to be healthy. This means that there is no rot, no bug infestations like termites, and no splitting or thin connections to the trunk. Failing to choose a healthy branch can result in it breaking from the pressure of the swing and then injuries. 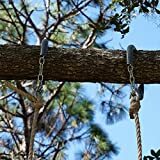 For many users, the easiest and best choice for hanging a tree swing is a tree swing strap set. 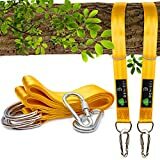 Typically, these are made up of a pair of cloth or nylon straps that wrap around the tree branch, and two carabiners that attach the straps to the swing. 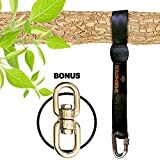 These straps are usually less damaging to a tree branch than other options and are less likely to harm the branch than other choices. They are also quite strong and are the often the best choice for tree swings. The Benicci Tree Swing Straps are capable of holding up to 2,000 lbs, and are fairly inexpensive, stylish, and high quality. If you have a swing that only has one mounting point (like a chair pod), you may want to check out the Goldnsend Tree Swing Strap with swivel hook. This one is capable of holding up to 2,800 lbs, and the swivel hook makes for never-ending spins! Chain, by virtue of being metal, is unquestionably strong and is extremely durable outdoors. The downside to using it is that it cannot be wrapped around a tree branch because the metal links cause a lot of damage. It is also more expensive than rope but far more durable. This means it is an investment for anyone hanging a tree swing and great for people who want a swing for the whole family. Any chain used should have some form of sealant or protective coating around the metal to prevent erosion and rusting from being exposed to the elements. There isn’t a difference between using big or small links, so go with whatever works. The Barn Shed Play Tree Swing Chain Set comes with a protective sleeve around much of the chain, which ensures that the tree branch the set is attached to does not get damaged by use. This option is incredibly durable, but it is rather expensive and offers only 1,000 lb of strength. Not all materials are made equally. When hanging a tree swing, it’s important to use something durable and long-lasting, but that also won’t damage the tree branch. Rope has been a common choice for years when it comes to hanging swings, but it can cause major problems. Namely, the back and forth action of the swing will pull the rope back and forth across the branch. Like sandpaper, the rope will eventually wear down the branch through friction. There are almost no circumstances where you should be using a rope to suspend your tree swing. Straps or chains are simply better options, so you should definitely start with one of those. If for some reason you really want to use rope for your swing, you should tie a layer of smooth rubber or other buffer material around the tree branch where the rope will go. The rubber will provide a protective surface for the branch and will also let the swing move easier. Then you can tie the rope around the tree, and to the swing. Just remember to remove the rubber when you’re done. Another option for hanging a tree swing is an eye hook. An eye hook is also called an eye bolt and is a small metal device with a loop on one end and essentially a screw on the other. These can be screwed into the tree branch and something like rope can be slung through the loops. The idea behind using bolts is that they won’t wear down the branch, but they obviously leave a hole. However, eye hooks or bolts are a decent option for a tree swing because they prevent wear and tear while being extremely strong –when installed correctly. People can then attach their material of choice in the loops, whether that be the rope mentioned above or even chain. 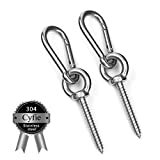 This Cyfie Hook set can be used for tree swings, hammock chairs, hammocks, etc. Once materials have been chosen, the swing needs to be hung. This can be done simply if someone reads the instructions and limitations about the material they chose and follow those closely. In most cases, you simply attach the loop to the carabiner, and you’re good to go. Tree swings can be a lot of fun for children and adults alike, so it’s important to stay safe in their installation and usage. As silly as it might sound, a tree swing can be a solid investment. Not in terms of financial gain, but in the fun a family can have while hanging out in the yard. Have fun and stay safe while doing so!